In the recent past I’ve not picked up my paintbrushes as often as I’ve used my ever-dependable Nikon. 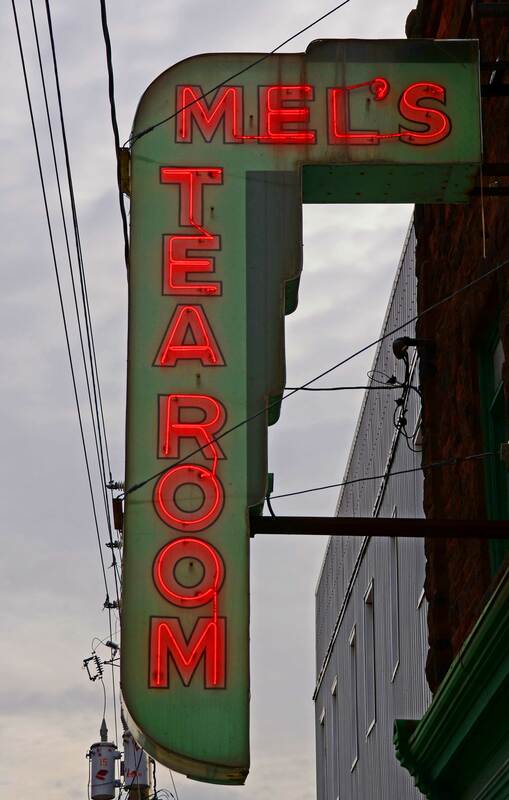 But something about the vintage neon sign hanging outside the Mel’s Tearoom diner in Sackville, New Brunswick and the photo (below) that I snapped of it a while back (earlier post here) inspired me to translate that image onto canvas — with some usual artistic license along the way. 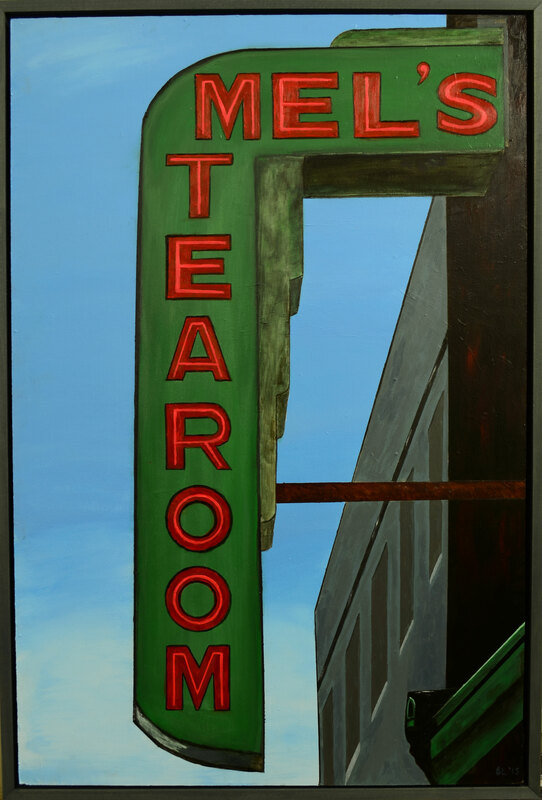 Perhaps seeing Toronto artist Andrew Horne’s marvelous takes on classic signage from bygone eras both online and at his Flying Pony gallery in Toronto contributed as well. In any event, the result is above (photo is a bit crooked), which I’ve happily finished and wrapped with a handmade floating frame. Efforts at painting like this are good meditative exercises and always enhance my appreciation for the skill and creative expressions of professional artists. Wow ! That’s fantastic Brett. Great job. Wonderful, Brett! Thanks for sharing with us. I love it! I manage a gallery in Hunter, NY and look at art all day long and I think your artwork stands alongside some of the best I’ve seen. That’s nice of you to see — thanks! Hunter is a wonderful town in the Hudson Valley and full of great art. You are so talented, Brett ! Perpetua, that’s nice of you to say. I’m just persistent. You painting just brought back many fond memories of my time in Sackville, right up to eating lunch at Mel’s with my dad before my convocation. Ciera, those sound like terrific memories! Sackville is a cozy place as I recall and Mount Allison University is a big presence there. Thanks for pointing out my mix up on the provinces — I had it right in my original post but for some reason reversed it later. Brett – that’s a lovely bit of work! Maith thú, as we say over here! I’ve never heard of it. Hmm? Nice work! This sign brings back good memories. My roomies and I lived just a few doors down from Mel’s Tea Room in our last year at Mt. Allison. I love your painting of it! Naomi, that’s terrific! Happy belated Canada Day wishes, as well! The painting is better than the photograph. Thanks! I often think about what painting can bring to expressiveness that photography can’t and vice versa. Part of that is the manner in which an image is composed, the choices made with that composition and the overall feel that can be conveyed by those different media. Great job! It is good to exercise those creative muscles.